Our mini break in Padstow lasted approximately 14 hours, yet we felt as if we’d had a whole weekend away. 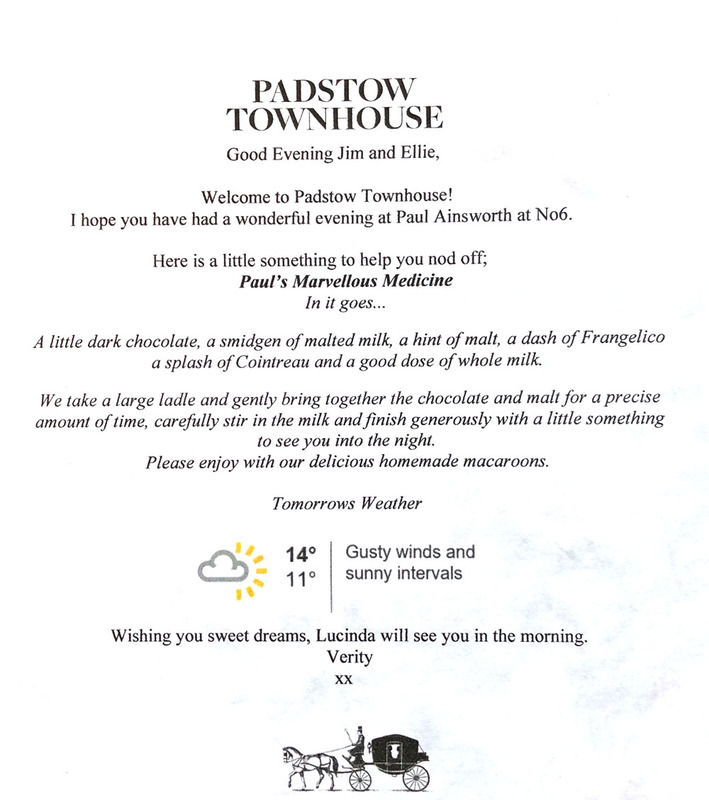 This is solely due to the comfort of Padstow Townhouse, and the warm hospitality extended by Paul Ainsworth‘s team. 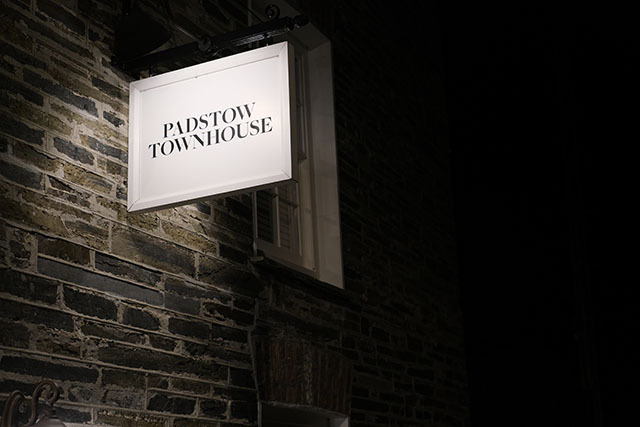 Paul and Emma Ainsworth opened Padstow Townhouse in 2015 after an extensive renovation. The listed building dates back to the 18th century and has been lovingly restored, retaining many of its original features. 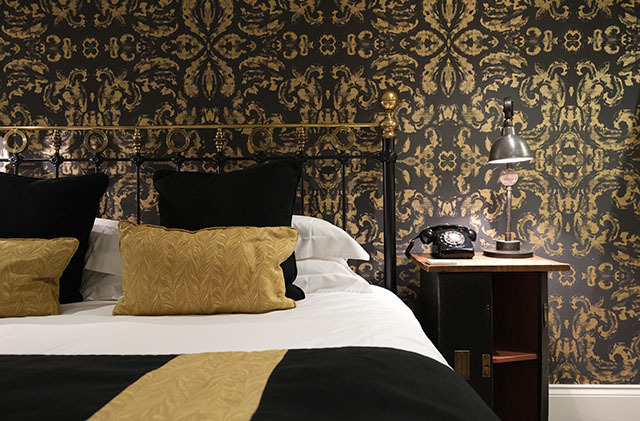 The boutique guesthouse has six beautiful rooms/suites, designed by Emma Ainsworth and Eve Cullen-Cornes (Tom Kerridge’s sister-in-law). Each is named after elements of Paul’s famous dessert, “A Taste of the Fairground”; we stayed in Honeycomb, a luxurious suite, with flecks of honey gold throughout. As well as a gorgeous bedroom with the most comfortable Cornish Bed Co. super-kingsize bed, our suite had a cosy sitting room with huge telly, and a mini pantry stocked with everything we could possibly wish for. We were asked what kind of milk we’d like (semi-skimmed), shown how to operate the kettle, which had different temperature settings, and the high tech lighting and heating panel was explained. 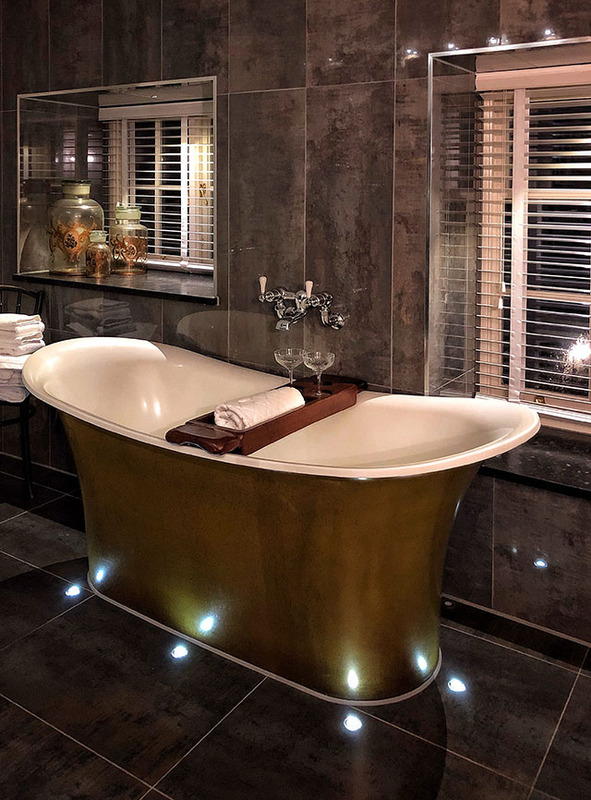 The adjoining bathroom was stunning, in particular the gold bath, complete with wooden tray with two crystal Champagne glasses. The double-sized shower had two waterfall shower heads, and heaps of heavenly hot water. A smart little wash bag contained an assortment of toiletries, made by Bloom Remedies for Padstow Townhouse. So gorgeous was the shampoo, that I ordered some when I got back home. Once we’d settled in, Verity delivered a snack to whet our appetite. 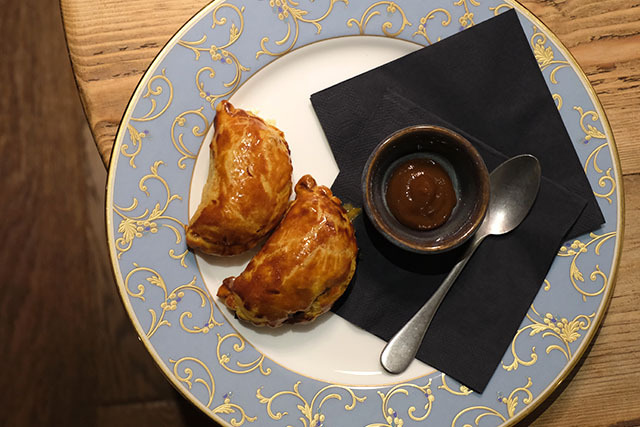 The perfect little lamb and seaweed pasties were served with a golden raisin sauce; a gentle reminder that this was no ordinary B&B, but a grown up guesthouse owned by a Michelin-starred chef. 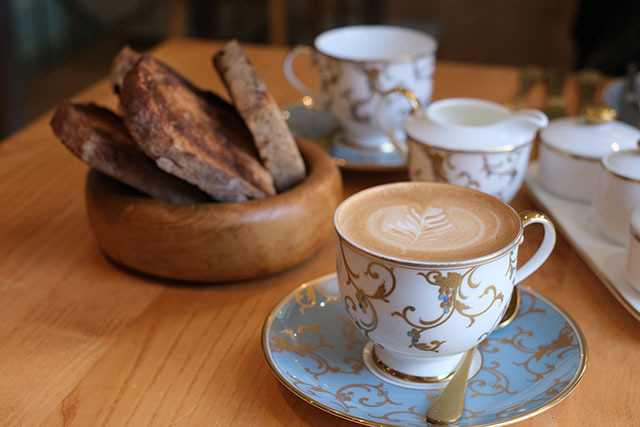 In addition to the provisions in each bedroom, guests are invited to make use of the Kitchen Pantry, where the shelves are stocked with cakes and scones, savoury snacks, and plenty of drinks, both hot and cold. There are cocktail ingredients (and recipes), wines, spirits and beers, and flasks for you to fill with drinks to take on picnics. We nipped out to No 6 for dinner, as you do. It was a fabulous meal, and you can read about it in full here. Suffice it to say, we ate a lot of fabulous food, before rolling back up the hill to Padstow Townhouse. I don’t want to spoil the surprise for anyone who might stay at the guesthouse, so look away now if you intend to visit. When we got back to our room, the bed was turned down, and on top of the duvet was a silver tray upon which sat a small flask, two little cups, a box of macarons, and a rather lovely note explaining what we were about to drink. 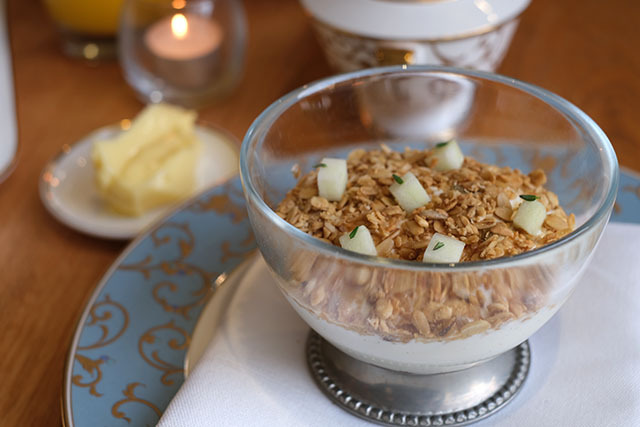 After one of the best night’s sleep EVER in a hotel (I don’t sleep well when I’m not in my own bed) we wandered down the road to Rojano’s in the Square, where breakfast is served to Padstow Townhouse guests. As if by magic the door opened just as we arrived; Lucinda had phoned from the guesthouse to let them know we were on our way. Restaurant manager Alex Tozer greeted us with his usual friendly enthusiasm. Having recently moved across from No 6 his new role at Rojano’s suits him, and the restaurant, well. Upstairs in the light-filled dining room, we ummed and ahhed over the extensive menu, and its appetising selection of hot drinks and juices, à la carte dishes, and set breakfast menus. Our hot drinks were served with semi-skimmed milk, because they knew that’s what we’d asked for in the guesthouse. Clever, huh? After eating so much the evening before we were intending on a light breakfast before heading off to work but, as usual, were tempted by the delicious sounding dishes and worked our way through the set menus. 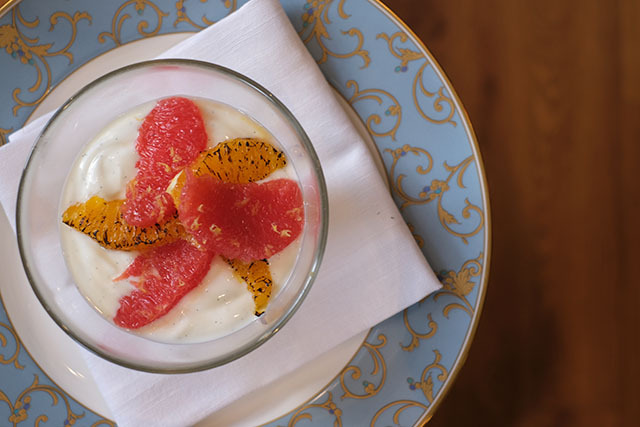 Jim’s starter was the “good morning trifle” (above), which consisted of Earl Grey soaked prunes, vanilla yogurt, granola and apple, and mine was a healthy bowl of pink grapefruit, torched orange segments, and natural yogurt. 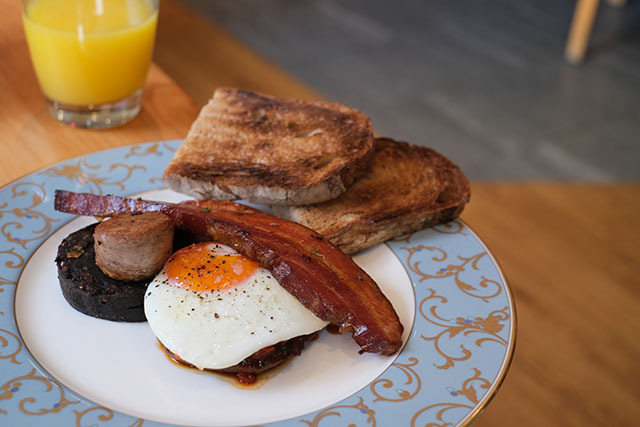 Jim then had a good crack at the “Full Cornish”: toast with thick maple cured bacon, sausage, black pudding, hog’s pudding, tomato chutney, brown butter roasted mushroom, and a fried St Ewe egg. My “Land and River” was delicious, something I’m going to try to recreate at home. 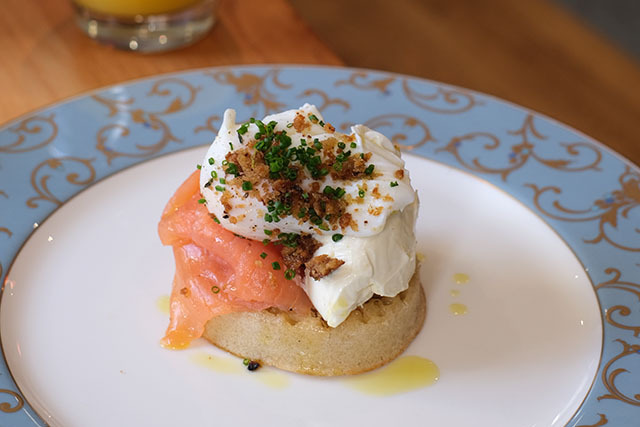 A toasted crumpet was topped with smoked salmon, a perfectly poached egg, cream cheese with lemon zest running through it, pangrattato, and chives. The attention to detail at all of Paul Ainworth’s establishments is exceptional, and I urge anyone working in the hospitality industry to visit either No 6, Padstow Townhouse, or Rojano’s in the Square (and ideally all three!) so that they can experience some of the best food, comfort, and customer service around. It really is a lesson in how to “do” hospitality. 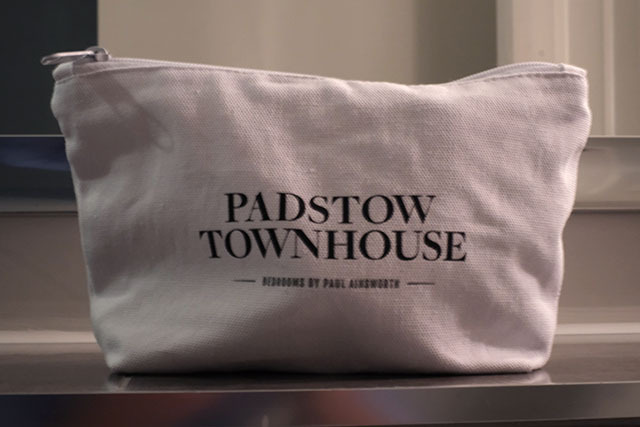 For more information or to book a room phone 01841 550950 or visit www.paul-ainsworth.co.uk/padstow-townhouse. SPECIAL OFFER: Book a two night stay up until 31 March 2019 and receive the third night’s stay, including breakfast, for free. See website for further details. We were guests of Paul and Emma Ainsworth. Thank you to Lucinda and Verity at Padstow Townhouse, and Alex and his team at Rojano’s for looking after us so well, and to Paul and Emma for their generosity.